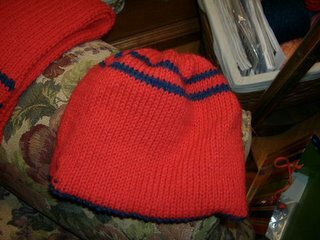 The hat is finished... at long last. That's the good news. The bad news is that it will never fit my nephew... after all this. 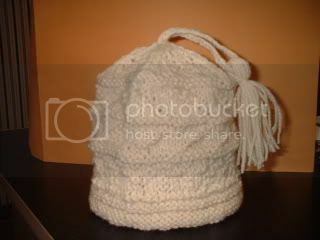 I couldn't have made a normal hat. No, I had to go for the gusto. It fits me... barely. It comes down to my ear lobes. I'm not sure it would even get to his ears. I will make him another hat I guess. 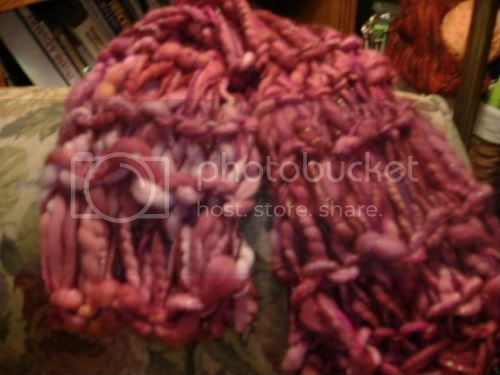 I have enough yarn but it is not going to be this hat. Nope. Not again. 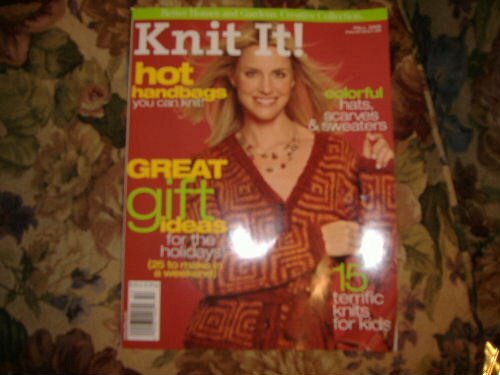 I swear I could have had a sweater done in the time it took me to knit this hat. Isn't it interesting that the red side looks smaller than the blue side? 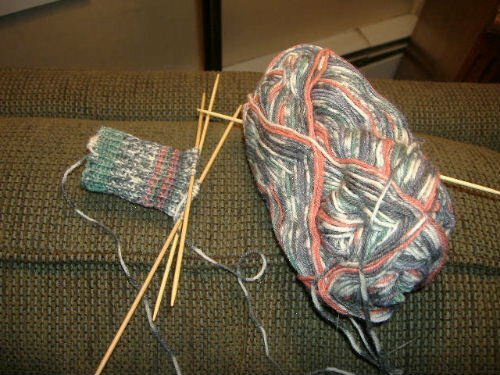 I think the red side definitely knit up smaller. 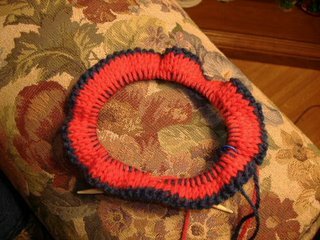 That would mean that I purl tighter than I knit because all the red stitches are purl stitches. Weird. Very weird. I have to say that while I didn't enjoy knitting this hat, the pattern is ingenious. Very impressive ... whomever came up with this technique. I admire people who's minds work that way. 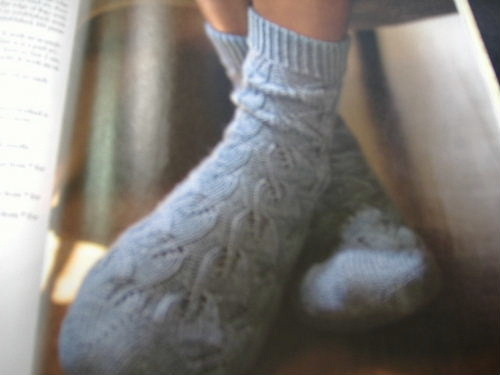 The pattern can be found on the Blue Blog if anyone is interested. Anyone with a lot of patience. I bought this camera in 1977.... the year we were married. 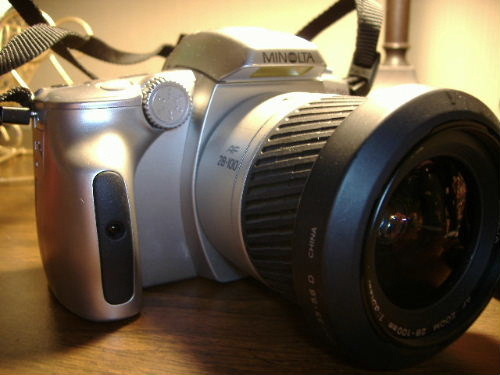 I saw it in a Spiegel Cataglog with all the different lenses and gadgets and I had to have it. I opened a Spiegel charge account to get it. Stolen from some knitting blog... I don't even remember which one! 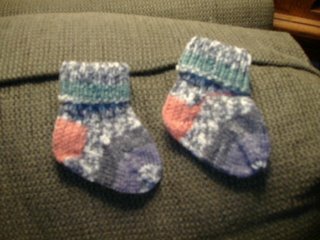 Our trip to Delaware gave me the opportunity to knit for about 7 hours! 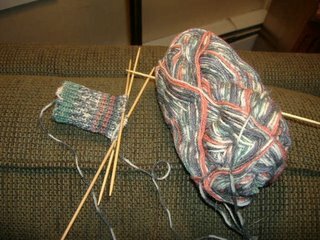 I finished Clark's scarf and one sock and made good progress on the second sock. 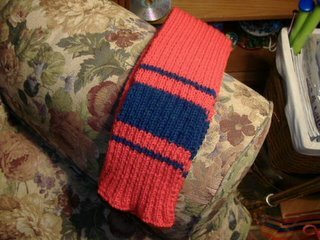 I will try to block out this ribbed scarf. I was up in the air about that thinking that no matter what, it will just go back to it's original shape. I don't like it so thin though so I'm going to at least try. 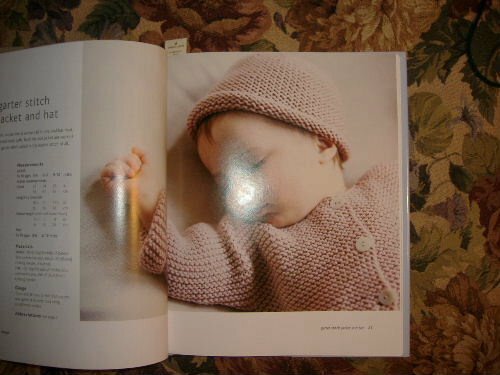 As you can imagine, my thoughts right now are back to baby projects. 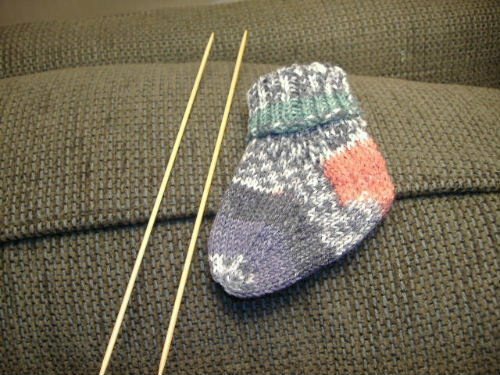 Hard to imagine that I'm going to have a grandchild to knit for! I really do want to use up some of the yarn I have and complete some planned projects before I get into that though and I do have until May to make something nice for the baby. 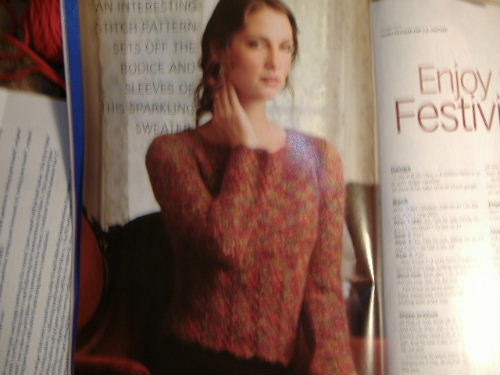 Actually, going into the summer, I have until next Fall to start knitting warm clothes for him or her. 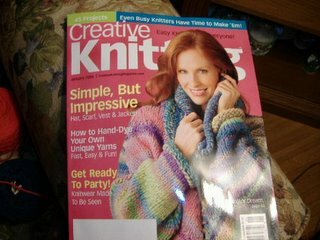 I'm thinking that a nice, lightweight cotton pinwheel blanket would be good to start. 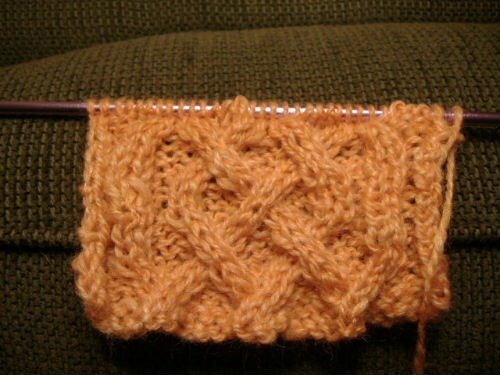 I've always wanted to do that pattern. I gifted Trellis at my niece's baby shower on Saturday. She really liked it. I found a cute little outfit that went with it very nicely. Next on the baby agenda is a sweater for my nephew's baby due in January. It's a girl... I'm thinking pink! 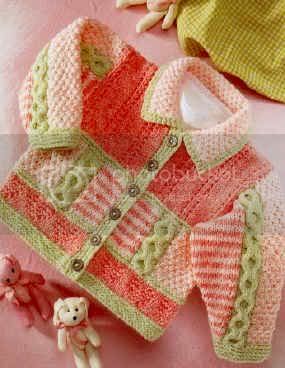 They already have a baby boy and I'm sure they will appreciate something girly this time around. Here's a cute photo of the two expectant moms. Our family is having a true population explosion! 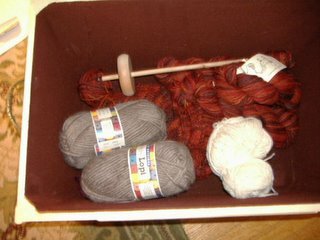 My husband politely suggested that my knitting basket was, shall we say, a bit of an eyesore in the living room these days with all kinds of things shoved in there and falling out all over the place, etc. So, I took the hint and went in search of a decorative container that I could still keep in the living room but hide all the mayhem. 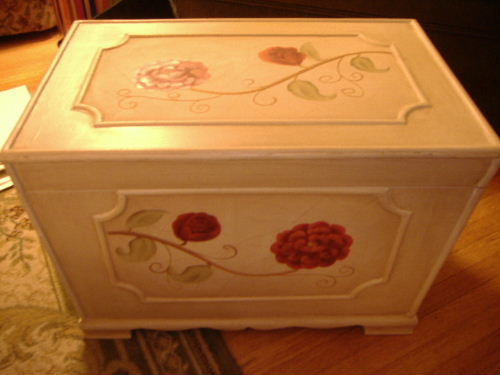 I found just the thing, a pretty wooden chest, at Value City. It only has enough space in it for my works in progress and I'll still have to keep a good bit of my other stuff in a different location, but I have to admit, it looks a lot better and my work is still at hand. 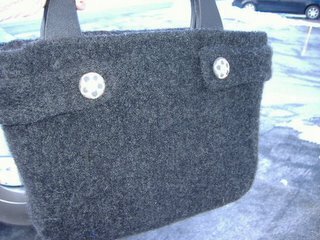 It has a velvet lining! No yarn will get snagged inside on anything. 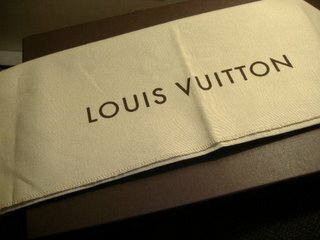 Run, don't walk, to Value City and check this out. 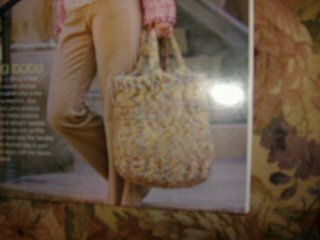 It was only $29.00 and really, it's fairly large. It's difficult to tell from the photo. Like I said, this was such an awesome package from my secret pal. 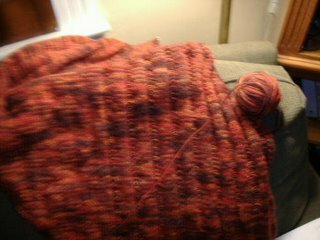 I didn't have this hand spun yarn in my possession for 5 hours before I had this scarf finished. 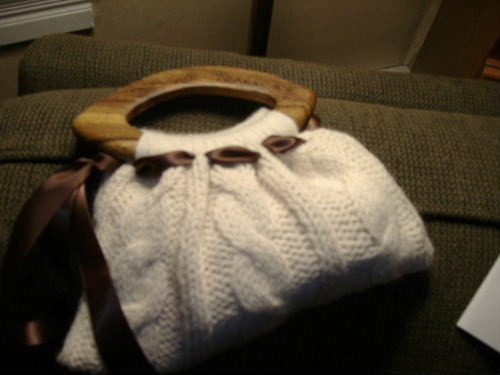 I knit it on gigantic needles with some of the yarn from the first package she sent me.... it was a perfect match. 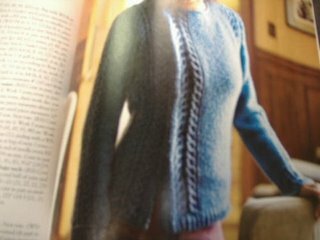 This photo doesn't do the handspun justice. It's just gorgeous. 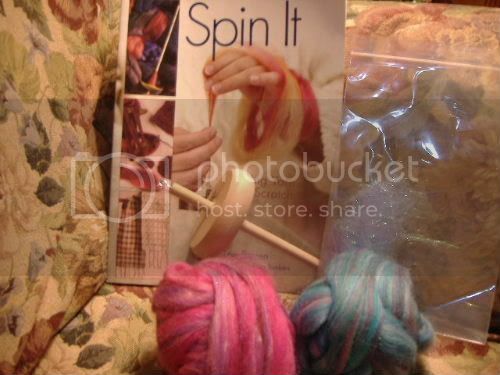 A book, a spindle, and some great fiber to get me started. I'm going to take it to my next knitting night and get one of the girls there to help me. I did try it on my own and I wasn't too successful but I think with a little help, I'll be good to go. And totally addicted. THANK YOU PITTSBURGH SECRET PAL!!! You really are the BEST! I'M GOING TO BE A GRANDMOTHER!!!!!!!!!!!!!!!!!!!! More about this on Monday!!! Well this is what I want and I want to see it on my daughter's table. If this weather doesn't cooperate, and we can't go to Delaware, I'm going to scream. I'm picturing myself having the Thanksgiving Buffet at the Ramada. So I have the decision to make today whether or not to shop for food to cook in case of canceled plans or let it go and end up going out if the weather gets bad. My daughter is freaking out. She says she can't do it without me but that is so much crap. She's a much better cook than I ever was.... already! She enjoys it. I hate it. 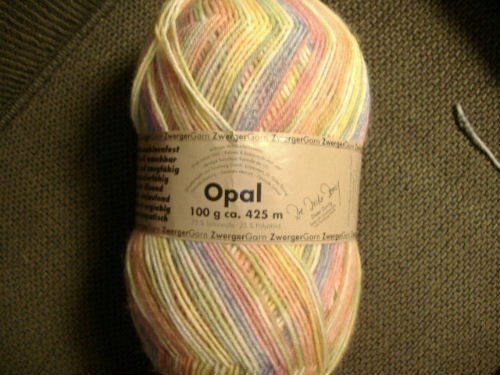 On the knitting front, I worked on the Opal socks last night. 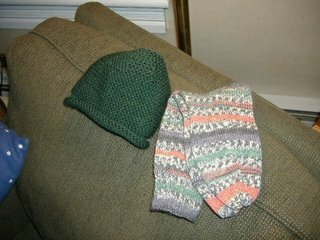 I have to get them finished for Christmas and I'm weary of the scarf and hat at this point. 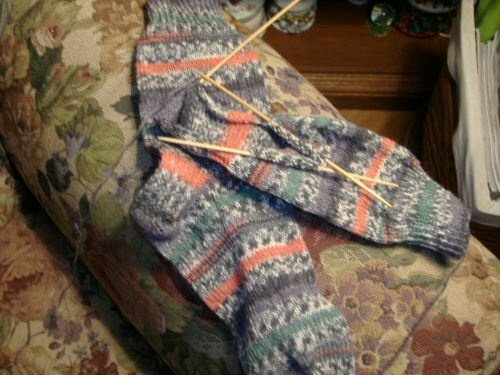 I'll finish the socks and then go back to them. I love knitting socks. I want to start socks with the hand dyed yarn my Pittsburgh Secret Pal sent me. I think I will do them even before I start Kepler which is really high on the priority list. I just want some warm, new socks for ME! 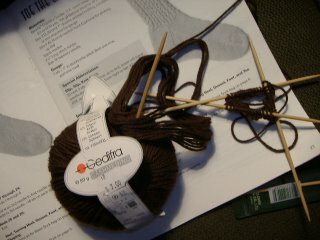 My LYS is getting some kind of new sock yarn in that's supposed to be very much in demand and with very limited supply. She asked me if I wanted on the list for that when it comes in so I said...sure... sign me up. 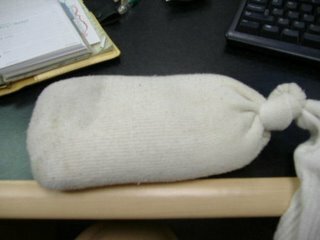 I don't even know what it is! 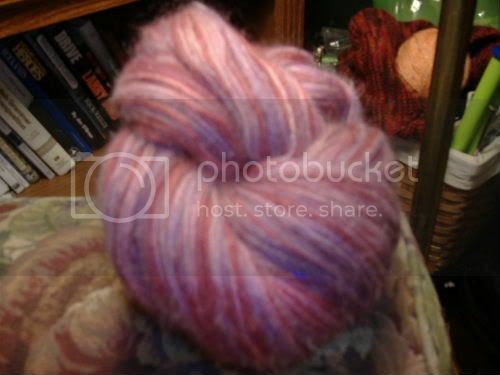 But there goes my vow not to buy more yarn until New Years Day. At the New Years Day sale I intend to purchase a bulky yarn for my daughter's big knock-a-round sweater. I'm not sure exactly what I want yet. I guess I'll know it when I see it. I do know that I don't want it to be a solid color. 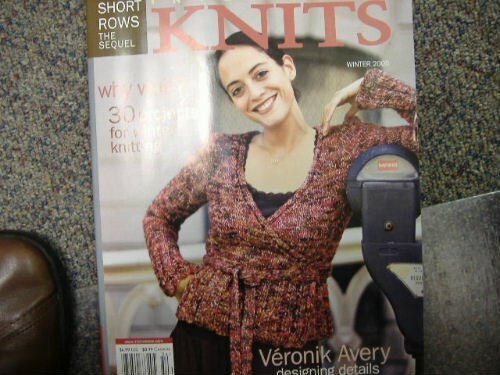 I'd love something "tweedy". Is that a word? Debbie Bliss has a bulky tweed yarn but my LYS doesn't carry her yarns. I'll think of something. So, I'm off to work. Have a wonderful holiday and keep a good thought that I don't end up at the Ramada buffet with a husband and two college kids all depressed that they missed the good meal at daughter # 1's. Color A: *(K1, bring yarn forward, slip 1, bring yarn back) 7 times, slip next stitch (color A) purlwise, place next stitch (color B) on cable needle and hold at back, place first stitch back on left needle and knit it together with next stitch (both stitches should be color A), bring yarn to front, place color B stitch back from cable needle onto left needle, slip both color B stitches purlwise, bring yarn back*, repeat *to* around. Color B: *(slip next stitch purlwise, bring yarn forward, P1, bring back) 7 times, slip next stitch purlwise (should be the stitch you decreased above), bring yarn forward, P2tog (both stitches should be color B), bring yarn back*, repeat *to* around. ARE YOU FREAKING KIDDING ME??? I'm dizzy just trying to read this let alone understand it. And it goes on from there in equally dizzying fashion. Eventually I will tackle this. Eventually I will work up the nerve to dive in. But for now I'm going to do what any red blooded individual with ADD would do.... work on the scarf. 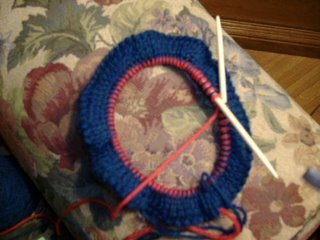 The double knit hat is such slow going. I worked on it for 2 solid nights and I have about 2 inches complete. 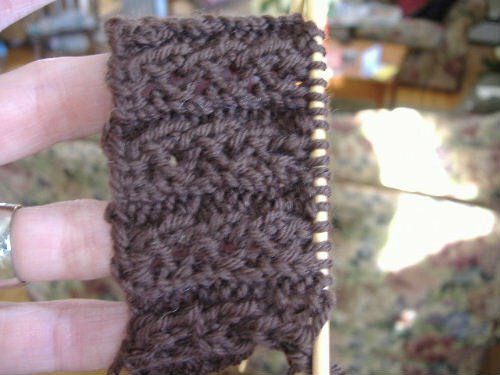 You figure that you cast on 132 stitches in two different colors and only knit one color with each row (but you have to move the yarn forward and slip the stitch you don't knit)... so, in actuality you're knitting 324 stitches to complete one row of both colors...on size 6 needles. This is going to take FOREVER. 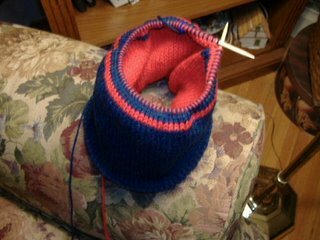 But in the end I know this is going to be the warmest hat I could have knit and I'm going to feel good about it. It's cold on those ski slopes! Tonight is our office holiday party. 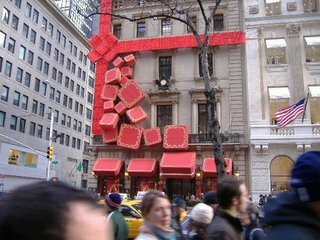 My boss likes to do it early so it doesn't interfere with other holiday happenings and people can relax and enjoy it without worrying about what all they still have to do to get ready for Christmas. At first I hated the idea of celebrating so early but it has sort of grown on me. 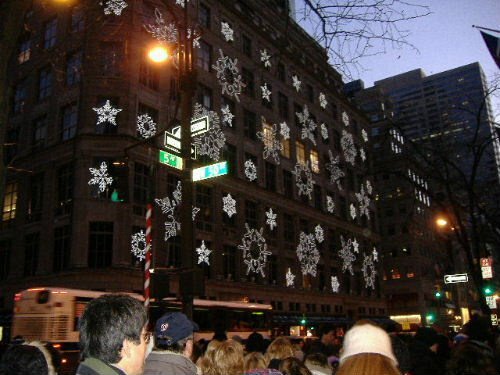 Then, tomorrow evening is our Board of Realtors holiday party too. I guess they have the same idea. 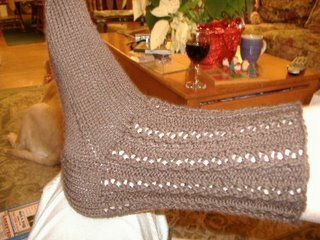 My knitting group is celebrating on Dec. 6th with dinner at a local restaurant and a cookie exchange. That should be fun. Last night I went to an Open House at a new, huge, dental office. 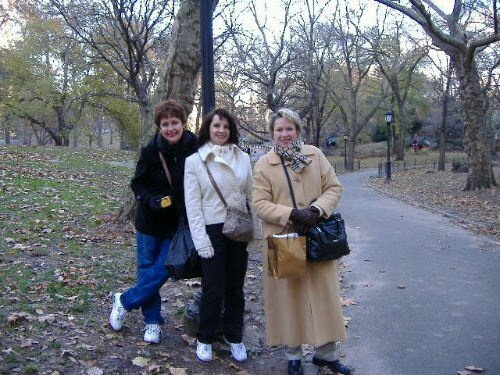 (we were involved with finding the site for the new construction) I was amazed at how dentistry has evolved. The new technology is incredible. It was like something out of "The Jetson's" if you're old enough to remember that cartoon. And the best part of all is that it didn't smell like a dentist's office..... yet. 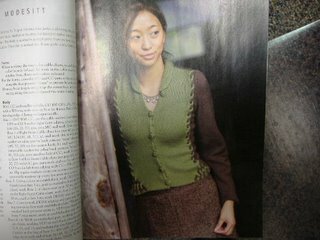 I need to stop at the LYS today and see if I can find something else to send to my PGH Secret Pal. I wish I had something in mind but I don't. I guess I'll know it when I see it. Ok.. well, this post was pretty boring...but that's all I got folks. Until I get that hat finished, I don't think I'm going to have much. I go out and buy a new camera and I still get blurry.......grrrrrrr. Anyhow I love this sweater. 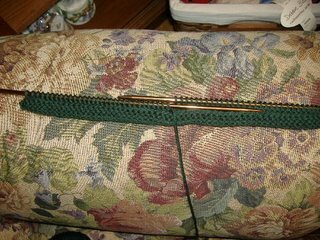 It's knit in bulky weight yarn on big needles (9's I think) and I bet you could have it finished in no time. I guess I'll have to add this to my list. This is the first time I've ever done this and it IS fun. But it's also slow going. 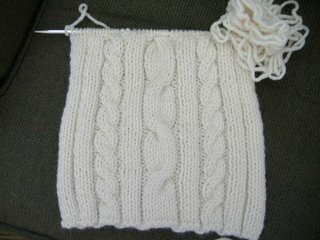 I feel like the winter might be over by the time I get this finished. 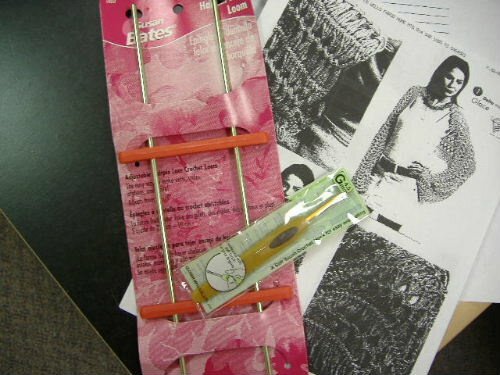 You alternate knitting and slipping the different colors on every row so essentially, you're only really knitting one color on each row. The result is a double layer of knitting. You can find the pattern here:the blue blog patterns: double knit cap She describes it as being "one warm a** ski hat", and, yes, it certainly will be. I'd love to make one of these for my son but to tell you the truth he loses everything he owns and I would want to scream if I went to the trouble and he lost it. 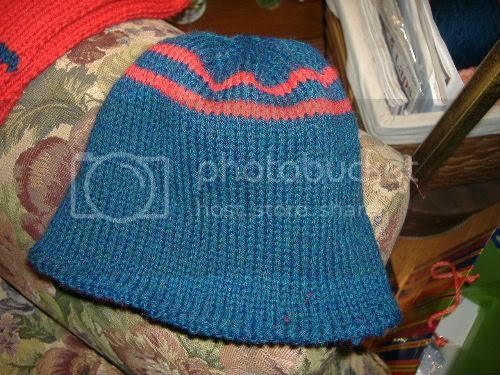 (He lost two hats I knit for him last winter) Hopefully Clark will hang on to this.